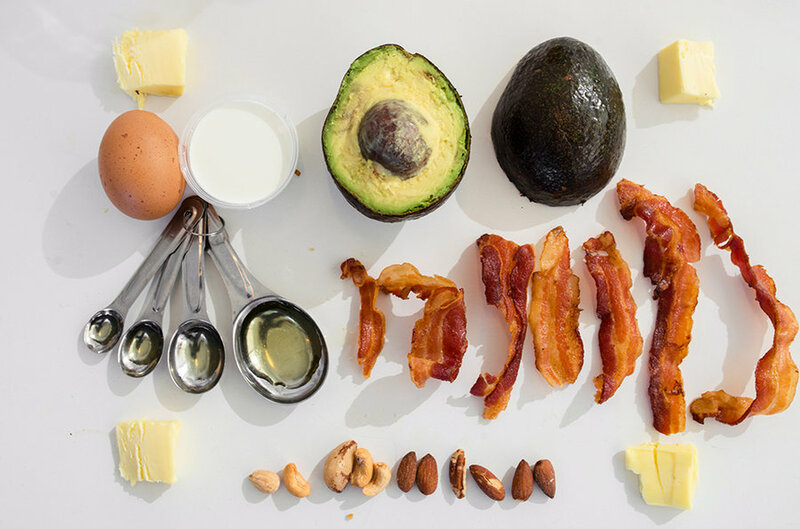 As research and public awareness into the ketogenic diet continues to expand, we are learning more about the incredibly powerful benefits of a ketogenic diet for health, wellness and treating disease. That said, many questions remain, especially for those who are new to the ketogenic diet and looking to get started. In this post, we take an introductory look at some of the top ketogenic diet benefits. Heads Up Health is a free program to help you track all your health metrics – including ketones. You can sign up for free using the button below. Or, read on for our “Eight Great Ketogenic Diet Benefits”. Over the course of millions of years of evolution, our bodies have developed the ability to run off of two primary fuel sources – fat and glucose (carbohydrates). When we consume a diet that is abundant in carbohydrates, the body breaks down the carbohydrates into glucose, which becomes the primary fuel source for the cells in our body. Conversely, when we consume a diet that is abundant in fat (and low in carbs), our cells can switch over and start metabolizing fat for energy. Lastly, in periods of calorie restriction (starvation, intermittent fasting, high-intensity or ultra-endurance exercise etc. ), our body will first burn off all our internal glucose reserves to fuel itself. If food is still not available, the body will then start burning its fat stores for energy. When we burn fat for energy, either through a low-carb/high-fat diet or calorie restriction, the body produces ketones. Ketones, as we are now learning, are incredibly powerful compounds for optimal human health. In more recent times, our fat-burning fuel system has become obsolete. We live in a society where we have unlimited access to cheap and abundant food sources based almost entirely on carbohydrates (bread, pasta, grains, cereal, rice, sugar, corn, alcohol, fruit etc.). One consequence of relying almost exclusively on glucose for fuel and never accessing our fat stores for energy is that our fat stores just continue to grow, and grow, and grow. This comes with a host of health risks which are now plaguing our society such as obesity, diabetes, Alzheimer’s disease, cancer and heart disease to name just a few. With the ketogenic diet, we are re-discovering our body’s ability to burn fat for energy. Whereas in the past this capability was used to help us survive and adapt to conditions where food was scarce, we are now learning how to strategically use this fat-burning fuel system for optimal health. We’ve had this ability for millions of years but somewhere along the line we lost touch with it. As it turns out, the cells in our body actually run better on ketones than they do on carbs. With a basic understanding of ketones under our belt, we can now look at some of the top ketogenic diet benefits. 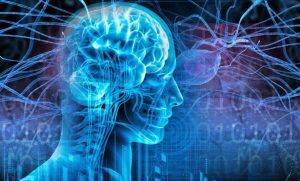 Ketones pass directly through the blood-brain barrier and are a preferred fuel source for our brains. In fact, by some estimates, our brains may perform up to 25-30% more efficiently when running on ketones over carbohydrate . The result is increased mental clarity, better focus and an overall sense of mental sharpness. 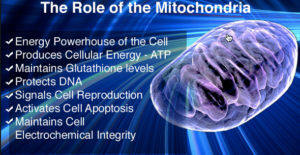 The mitochondria are the power plants that produce energy in every cell in our body. 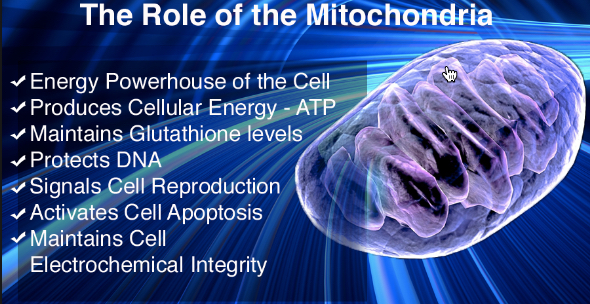 Much like our brains, our mitochondria have evolved to be more efficient when burning fat (in the form of ketones) over carbs. With a more efficient and cleaner burning fuel source for our mitochondria, ketones can provide a steady boost in our energy levels. Ketones work in the body as a natural appetite suppressant. The exact mechanisms are not yet fully understood, but early research suggests that ketones signal to the brain we are in a fed state, thereby reducing appetite and food cravings. As we enter a state of ketosis, we are reprogramming the cells in our body to burn fat (instead of carbs) for energy. This forces the body to dip into its fat reserves and burn the fat as energy. This is part of the reason why the ketogenic diet is so effective as a natural treatment for losing weight, treating obesity and improving body composition. Ketones reduce inflammation by directly inhibiting NLRP3, which is part of a complex set of proteins called the inflammasome. The inflammasome drives the inflammatory response in several disorders including autoimmune diseases, type 2 diabetes, Alzheimer’s disease, atherosclerosis, and auto-inflammatory disorders. Ketones are a natural mechanism to reduce insulin and blood sugar. 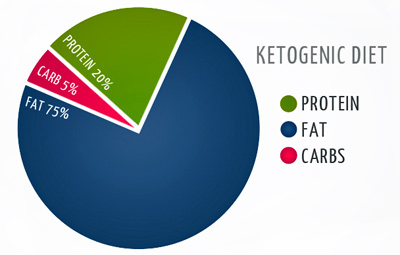 The ketogenic diet is also very low in carbs, which keeps blood sugar and insulin down. As a result, the ketogenic diet (and other low-carb/high-fat diets) can be an effective and natural strategy for treating conditions such as type 2 diabetes, obesity, Alzheimer’s and other metabolic conditions. There are a number of studies currently underway exploring the ketogenic diet for cancer treatment . The presence of ketones seems to inhibit the growth of cancer cells . Additionally, since many types of cancer cells can only survive with glucose as a fuel source, we may be able to starve cancer cells through a low-carb/high-fat diet where ketones become the primary fuel source in the body. The ketogenic diet has also been used effectively as a treatment for epilepsy, polycystic ovarian syndrome (PCOS), irritable bowel syndrome (IBS), heartburn (GERD), nonalcoholic fatty liver disease (NAFLD), brain injury, dementia and many more. Although many conventional doctors and health professionals may not be up-to-speed on the latest research into ketogenic diets, when used properly, it is a safe and effective strategy for improving health and treating a host of “western” diseases. In fact, given all of the health challenges and chronic diseases now being linked to the Standard American Diet, the ketogenic diet (and other low-carb/high-fat approaches) may actually be a safer and more effective nutritional strategy for optimal health. The diet does come with its own set of challenges and it can be very difficult to implement and maintain. If you prefer to work with a professional, seek out a doctor or health professional who has expertise in the ketogenic diet and who can guide you along the way (see appendix for recommendations). 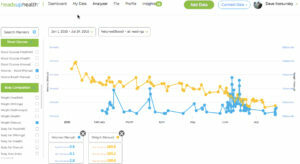 Heads Up Health was designed to help you track all of your health metrics in one place. 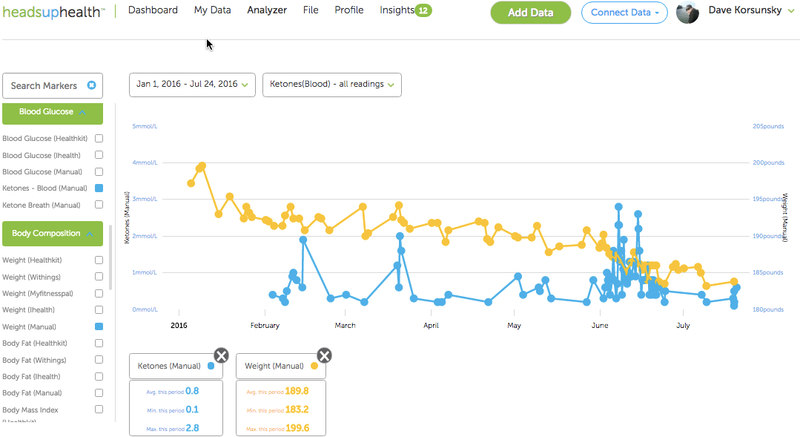 Everything from weight readings to ketone values to cholesterol levels can be tracked within the app. The video below is a short tutorial on how to use Heads Up Health for tracking ketones. The same features can be used to track blood sugar, weight, body fat and even your medical records within one single, secure online portfolio. You can learn more about the Heads Up app on our homepage. We also give you tools to look at trends over time, correlate different metrics and share your data with any health expert you choose. The graph below is showing weight and ketone readings graphed together in Heads Up Health to see how ketosis is affecting weight loss. The ketogenic diet triggers a natural process in our body where we metabolize fat for fuel as opposed to glucose. A benefit of fat metabolization is the production of ketones – which offer a number of powerful benefits for human health. We are just now re-discovering this fat burning capability and learning how we can use ketones and the ketogenic diet to affect a number of powerful health outcomes. For more information on getting started, check out our blog post: 5 Steps to Jumpstart the Ketogenic Diet. You can also sign up to Heads Up Health below and start tracking all your health metrics as you make the switch to a ketogenic diet. If you have any questions, feel free to shoot us an e-mail.